Academic Writing has been written for intermediate level students who are preparing to study, or are already studying, in an academic environment and need to improve their writing skills. 'Academic Writing' provides students with: - a variety of group, pair and individual planning and writing tasks - plenty of practice to help with each stage of the writing process - models of writing that are based on real assignments 'Academic Writing' takes students from paragraph structuring to essay writing through a process approach. It teaches learners how to order and link paragraphs into cohesive and coherent essays and to create the various paragraph types that are used in written assignments. 'Academic Writing' includes work on how to generate ideas, organis material, draft, review, amd revise written work. There are extra sample and reference materials at the back of the book, including models of essay development and a punctuation guide, to help students learn to evaluate their own work. 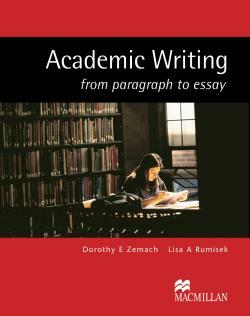 'Academic Writing' includes a complete answer key and can be used in class or as a self-study book.